Tall growing with fluffy flowers Thalictrum are one of the all time favourite cottage garden plants. They grow naturally in partly shaded damp areas, however in a good humus rich soil make excellent garden plants. 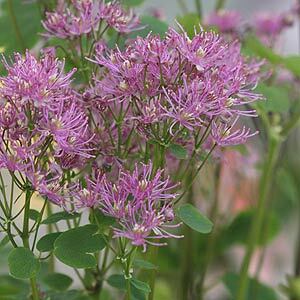 Thalictrum is commonly known as Meadow Rue, and a variety of plants and species are available for sale, including both pink flowering and white flowering species. Thalictrum aqualegifolium is the pink flowering species pictured right,. Thalictrum delavayi has mauve flowers although a white form is also available. Thalictrum flavum glaucum is a lovely pale yellow to creamy white flowering species, good green blue foliage and large fluffy heads. Fern like foliage and fluffy flower heads held well above the foliage make this a great woodland plants for the shaded border. T. rochebrunianum is a white flowering species and is originally from Japan and is available from some mail order nurseries. A moist humus rich soil in a position with filtered or dappled light. Humidity can be a problem. Little care is required, plants can be deadheaded if required, however these plants are a little reluctant to self seed, and we have been growing it for 15 years. A tidy up at the end of winter is all,that is needed.